Southeast Water Users (SEWU) wants to let its members know that American Water Resources of ND has started an informational mailing campaign as some our members have received a mailer offering a water line protection program. This company has no affiliation or endorsement from SEWU. SEWU covers all cost of repair of water line up to the curb stop on your property. Any water line after the curb stop is the homeowner’s responsibility for any repairs. If you have any questions about what water lines are covered by SEWU, feel free to give our office a call at 701-242-7432 or 800-400-8888 (in ND only). Please note that our new Payment Service is available. The Make a Payment quick link shown at the right is where you will go to set up your account with us. That is a one-time registration and will be used in all future payments you make with us IF you use the site. Please note that you will only need your PIN# (KEY #) for registration and not your account #. There are a number of ways to pay your bill and a lot of information available for you to view. There is also a place where you should be able to enter your meter reading at the same time. For those of you who are already signed up with Auto Pay/Direct Pay with us, you may enter your meter readings here, opt out of paper bills and receive an e-mail billing, check usage charts etc. with a registered account. Please take the time to give the PSN site a look to see what it can do for you at your time and in the comfort of your own home any time day or night! If you have trouble with anything at all, please either call PSN at their number on their site or give us a call here at the main office at 701.242.7432. PLEASE NOTE THAT IF YOU DO NOT HAVE ACCESS TO A COMPUTER, CALL AND WE CAN DO THE TRANSACTION FOR YOU OVER THE PHONE ON AN INDIVIDUAL BASIS. Some of you will be receiving your first water billing in the mail. The first month all we need is your meter reading by the 15th of the month. IF you are not hooked up yet, you will need to call the office and let us know. The In-System Expansion has been ongoing for the last 2 years. Hoping to acheive a potential of finish of the project in the fall of 2019. The construction crew will be retuning as soon as the weather is condusive and will bne working west of the James River to complete the project. Once the curb stop is set in your yard, they need to flush the line and send in water samples to the lab, At that point, we need 2 samples that pass their test and then the office is notified here and we will send out a "Water Ready Letter". You may NOT dig in the line or hook up the water until you receive a letter or a verbal transmission from this office! We need to have confirmation that your water is safe for consumption. Pictures of the assembled meter package & the actual water meter with instructions for the New Expansion Members! Some new payment methods have been added to the website as you can see on the right side of this front page call Make A Payment. PSN is a new payment service for you to use at your discretion. Take a look to see what is offered - we think you will like what you see! As always, if you have any questions, please let us know. 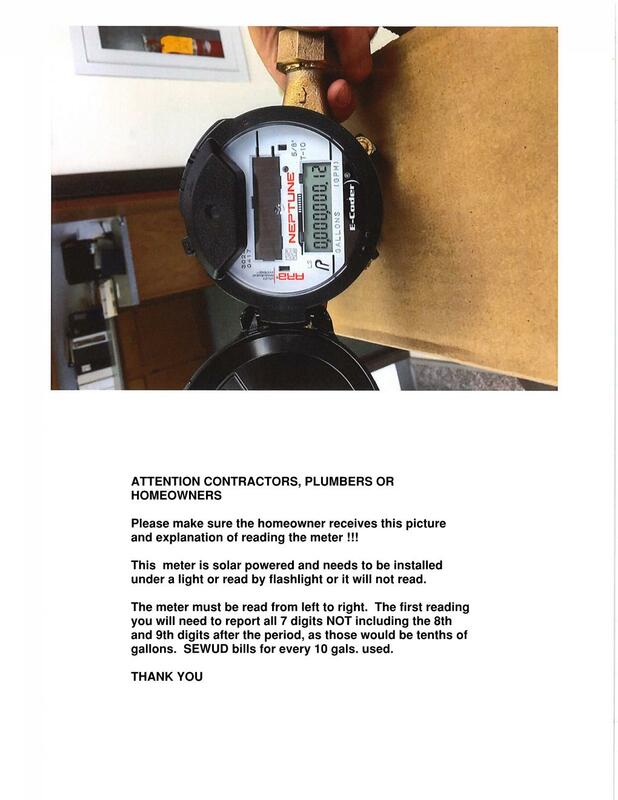 Please remember that we need a new meter reading each and EVERY month or the computer automatically issues an average (yearly avg.) for the month and assesses a $5 penalty for no reading. For those of you who do Direct Pay or Auto Pay by Bank and those of you who send in E-checks, we need those readings around the 15th of each month as billing is done at different times every month. If you register your account with the new PSN site, you can enter your meter readings there and they will automatically be downloaded to your account saving the office time and money! Please call the office with any questions. Paul has been busy with a few line freeze ups this early spring. After a very long and cold winter, some lines have frozen so that water is not flowing. Fortunately it is not affecting too many household sites. We are working quickly to remedy the situation. This area will be the site where the new In-System Expansion will begin west of the James River. The contractors and us will be extremely happy if we can get this construction project wrapped up this year. There are some people in the area asking for your help in signing easements so that we can get this quality, affordable water to the people who have signed up and are looking forward to receiving. Without your help, we cannot reach the people who want water. If any of you landowners have a question, please do not hesitate to give the office a call and someone will be glad to help you.